We are fortunate in being able to publish an interview with Anne Digby, children’s author and writer of girls comics stories. The title she is particularly associated with is Tammy, of course, which saw publication of various text stories written by her, as well as comics adaptations of her already-published children’s books, also done by her. Below she gives some previously-unseen information on her past time in this comics world, which we are very grateful to have. 1 I was interested to see your interview with www.booksmonthly.co.uk this month as I know you rarely give interviews. I would love to know more about your experiences of writing for comics and how you first started, and how this led on to writing children’s books. Hello, Jenni. Well, like a lot of people, I’d always wanted to write books. The seed was sown in primary school when I had a poem published in a children’s magazine and the prize was a handsome hardback entitled, I think, “Sheila’s Glorious Holiday”. I thought how exciting it might be to write a whole book one day and see that in print, too. At sixteen I became an editorial trainee at Fleetway House and then later become a freelance writer. My first published work of any substance was a full-length book entitled “Ella’s Big Sacrifice” (Schoolgirls Own Library, 1960). 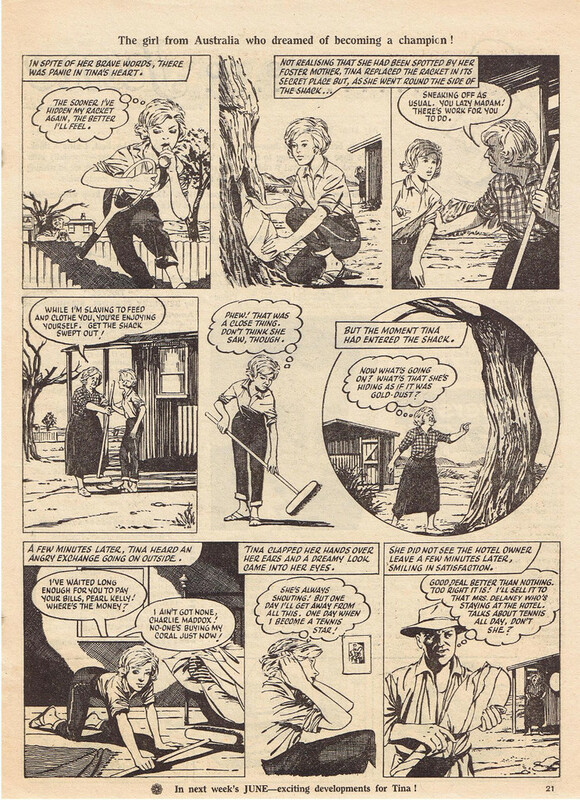 In those days the girls’ comics still carried text serials and stories alongside the picture-strips and the best of these were republished in book form under the Schoolgirls Own Library imprint, together with some new works. S.O.L. published two titles a month and, to keep them affordable, they were printed on poor paper and in tiny print. So my first book was hardly the handsome hardback I’d once dreamed about – but at least it was a start. 2 At what stage did you start writing stories in picture-strip format? When did you stop? It’s difficult to date this exactly. My freelance career in the 1960s was quite varied, including straightforward journalism, which involved a certain amount of travel, and at one stage a staff job with Oxfam. But I always kept my hand in at writing stories for children and the market for picture-stories was becoming much larger than for straightforward text. I adapted to this quite happily – in fact back in my schooldays I’d written and drawn a picture-strip for an unofficial magazine we produced. (This was once confiscated, an episode that was to become the inspiration for one of the plot threads in First Term at Trebizon!) So, once I became a stay-at-home Mum, I dropped the journalism and just concentrated on children’s fiction – in either format – which could be written from the comfort of home. 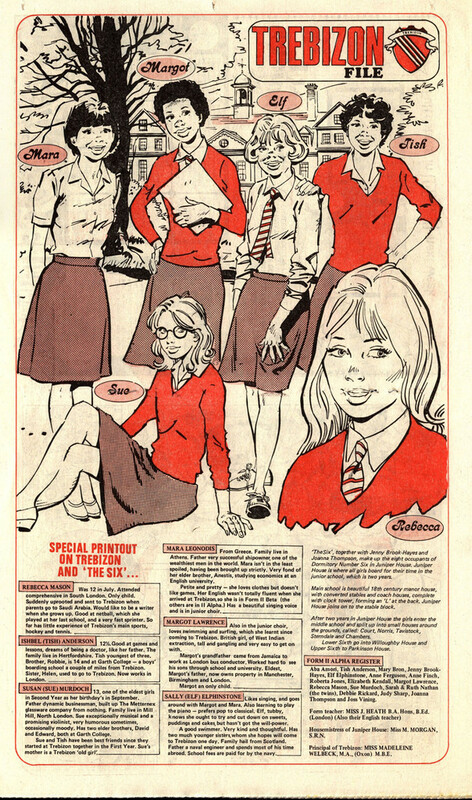 And when, by the 1970s, the market for girls’ weekly comics with a strong fiction base was shrinking in favour of text-based mass-market paperbacks, it was a natural progression to move on to children’s books. 3 Your trajectory as a writer has involved the movement back and forth between prose fiction and picture-strip fiction. Can you tell us a little about what differences you see between the two kinds of story-telling media – the things that work better or less well in each, the adaptations that you perhaps had to make when moving between one and the other? What a fascinating question. Do you know, I think I found remarkably little difference. I think this might be because – once I’ve hit on the basic idea – I’ve always first visualised stories in a filmic way, certain key scenes/ images which appeal to me, around which I create the rest of the plot. Another point is that writers and artists never worked in a collaborative way at Fleetway or Odhams Press – at least, not to the best of my knowledge or in my own experience. When starting a script I had no idea who would be drawing the pictures. I always had faith in an editor to marry the script with the right artist – and some of them were brilliant. One had a blank sheet of paper on which one drew up a grid, sketching in each scene for an instalment (like events in a book chapter), then one went on to describe each scene, frame by frame, for the artist’s guidance – together with the accompanying dialogue, to indicate the size/number of speech balloons required for each frame. As these descriptions were not for publication, they would be less formal than if they’d been written for a prose work, but that was the only real difference. For instance, I remember I was once invited to adapt two of my books into picture-strip serials for Tammy. I discovered that both of these scripts – for “A Horse Called September” (which I’d already published as a text serial) and for “First Term at Trebizon” – in fact just about wrote themselves! 4 I’m sure every writer has their favourite creations. As you look back on your time of writing for Tammy and other similar titles – are there any particular stories that you are still really pleased to have written, or maybe some you’d prefer to expunge from your memory? Well, I’m sure there may be some of the latter, but if so they are safely expunged already. Going even further back, I suspect that “Ella’s Big Sacrifice” might be one of them. As far as picture strips go, my favourites include “The Dance Dream”, “Olympia Jones” and “Tennis Star Tina” – (Trebizon readers might guess that I’ve always loved that particular sport). All three stories were reprinted at least once, so hopefully the readers liked them too. Once again, many thanks to Anne for providing the above interview. Her popular (or indeed, classic) Trebizon series is being reissued by Egmont on the 28 January. Misty fan added scans from “The Dance Dream”, Girl annual 1982 reprint. Edited to add: thanks to poster Peace355 on the Comics UK Forum, here are two pages from “Tennis Star Toni” in June (issue dated 10/06/1961; art by Giorgio Giorgetti). Here also are the pages from the first episode of “First Term at Trebizon”, with associated factfile, from Tammy 19 November 1983. It ended in Tammy 4 February 1984. Thanks to Peace for this, too. Edited to add: the following stories written by Anne Digby and printed in Girl have been catalogued by Phoenix on the UK Comics Forum. Many thanks to him for this extra information! ‘Trebizon’ I still have to read. ‘Olympia Jones’ and ‘The dance dream’ are stories I’ve re-read several times. Could ‘Tennis star Tina’ be ‘Tennis star Toni’ from June and School Friend? I don’t know Tammy well enough to be sure, but I don’t believe that AD wrote for J&SF so I had assumed it would be a Tammy story. I found some information on internet: ‘Tennis star Tina’ was published in June in 1961, and reprinted as ‘Tennis star Toni’ in J&SF in 1967. Perhaps they changed the name because in 1967 the comic Tina had been launched. And an interesting fact: in 1961 the artist was Giorgio Giorgetti. But for the 1967 reprint, Robert MacGillivray replaced all the faces of the original comic. Weird, isn’t it? Very odd! I wonder why? 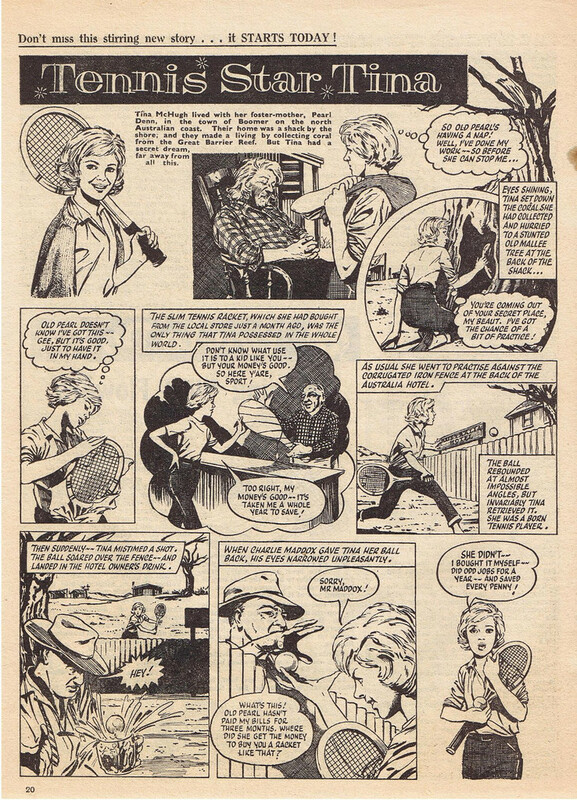 Anne Digby confirms that “Tennis Star Tina” from 1961, reprinted as TSToni, is indeed the story in question. I’ve only got two Junes from 1961, and unfortunately ‘Tennis Star Tina’ is not in one of these. I do have all the 1967-episodes. It would have been nice to compare the original artwork with the ‘retouched’ version from 1967. Nope, there wasn’t a story in Tammy with either of those titles. Nice interview, by the way. It’s always interesting to read about the people who were involved in creating the comics. Thanks! I love this sort of info too, and of course it’s the sort of thing that if you don’t ask, then it doesn’t get recorded and then is lost. Tammy did a couple of adaptations of Trebizon. The Fourth was done as a text story with Diane Gabbot doing spot illustrations. The First was done as a picture story, by Phil Gascoine. I loved the Trebizon books when I was younger. Tammy was before my time but when I got some in later years I was delighted to find the Trebizon stories in it. I have added some scans from The Dance Dream. Art is by Douglas Perry. Eduardo Feito was a popular choice to illustrate Anne Digby’s horse stories, such as Olympia Jones. In fact, he was a popular choice for horse stories in Tammy full stop, and he drew loads of them for her. ‘Ella’s Big Sacrifice’ is a fun tale about Paradise Found, Lost & Found Again (albeit with an overuse of the word ‘lovely’), but one odd thing is that it actually appears to be a sequel to a previous story. 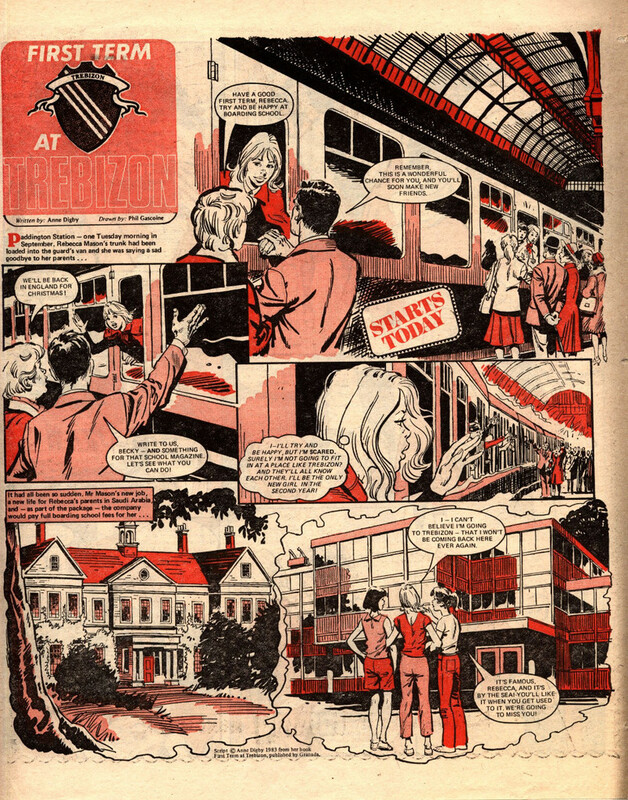 In the interview Anne mentions that Schoolgirls’ Own Library often reprinted serials from Fleetway’s weeklies so it may well be that the characters had already appeared elsewhere – either written by Anne herself or another author.